City tour in the "City of Kings" - Daily departures in the afternoon (Duration 4 hours). Night at the selected hotel. Transfer from hotel to the airport in Lima. Transfer from the airport to hotel in Cusco. Tour to the Ballestas Islands and Paracas Reserve. Trip on bus Paracas - Lima. Transfer from the bus station to the airport in Lima. The price of our Tours include transfers to these stations. The discount for foreign students will only be possible with your student visa card (because ISICARD is no longer valid). 1 City tour to the "City of Kings"
1 airport transfer to Cusco hotel. 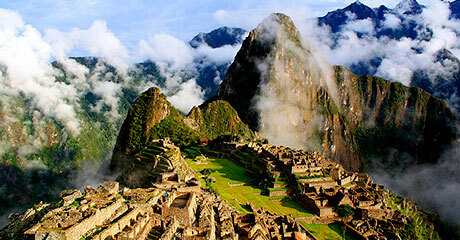 1 andalusia Tour Inca Trail 4 days and 3 nights. 1 Transfer from the bus terminal to hotel or airport. We'll be waiting for you at the airport in Cusco on your arrival date, take you to the hotel where you will rest for an hour, you'll have a cup of coca tea and we will pick you up from your Hotel in the afternoon (13:30 hrs) to start with the tour around Cusco and outskirts. The Cathedral.- Colonial religious monument of extraordinary artistic value. Sacsayhuaman.- Built at 3 Km. From the city of Cusco, impressive stone fortress with an excellent architecture, Famous for its huge carved stones some of which are at 9 m/ 30 feet off the floor,with a weigh of 350 tons. Here is where the Inty Raymi or Fiesta del Sol is held in June Every year. Qenqo.- Ceremonial and ritual center, amphitheatre where sacrifices were made. Puca-Pucara.- An old tambo (resting place), monitoring place throughout the Inka Empire Routes. Cuzco: Inca Trail Start Meet at the office at 05.45am to board the bus. Ensure you have your original passport and student visa card (if applicable). The journey to trailhead at km 82 takes approximately 3 hours. We will enjoy breakfast along the way. Walking times are always approximate depending on weather conditions, group ability and many other factors, but you will walk about 2-3 hours before lunch. After lunch, we walk on just past the village of Huayllabamba to our first camp (3000 mtrs). This first day we will walking through the valley. It starts at 2380 mtrs with a small climb to a platform overlooking the Inca site Llactapata where rewards you with superb views of Mount Veronica. Inca Trail Day 4 is the most difficult day because we're going to walk from about 3000 mtrs to 4200 mtrs the highest point of this trek (Dead Woman's Pass). You can walk at your own pace, stop to get your breath whenever you like. You'll find your energy returns once you continue down to the valley of Pacaymayo. Campsite at 3600 mtrs. You can hire a porter from the village of Wayllabamba to carry your pack to the top of the pass for approximately US$ 120.00. You must organize and pay this money directly to the person who carries your items. Please check your belongings upon receiving them at the end of this service. Inca Trail Day 5 is exceptionally beautiful because of the ruins and incredible paved trail (and more importantly for your lungs, there is a lot more down than up). There are about 2000 stairs descending from Phuyupatamarca to Wiñaywayna, so take care with your knees). If you have had knee or ankle injuries an extra porter is recommended so that you are not carrying extra weight and overstressing your joints. Guided tours of all the ruins. Camping is usually at Wiñaywayna (2700 mtrs). Take extra care of your personal belongings in this campsite as all the tours camp near here. As usual always keep your daypack with valuables with you. The only hot shower on the Inca Trail is on this third night at Wiñaywayna. There is a hostal near the campsite with an 8min hot shower for 5 soles, and a bar and restaurant where you can purchase bottled water. Inca Trail: Cuzco Get up extremely early to arrive at Intipunku, "The Gate of the Sun," and view the first sun illuminating majestic Machupicchu. It is still a 20 min walk down from here to the famous view from the terraces at the end of the trail. Take your photos now before the 10:30hrs crowds arrive. Your tour of Machupicchu should finish between 10:30 hrs and 11:00 hrs and you have free time to climb Huayna Picchu (it will take at least 90 minutes). A maximum of 400 hikers can climb this mountain per day, so start immediately after your tour! Or just collapse under a tree and quietly reflect in amazement at the mystery, the architectural achievement and beauty of Machupicchu. If you want to access to the Huayna Picchu mountain, contact us. TOUR TO THE SACRED VALLEY OF THE INKAS: this tour starts around 09:00 hrs., we pick you up at your Hotel, we have a guided tour to the Sacred Valley of the Incas, over the Vilcanota river, with a panoramic view of Pisac an old Inca City and a visit to the Inka market in this village, where we will have the chance to know in a closer way its people customs and get good bargains with the handycrafts and souvenirs sellers, afterwards we'll head for Urubamba, traveling on the borders of the river Vilcanota. habitants invasions. We'll have the chance to walk by the narrow streets and have a clear knowledge of how this militar, religious and cultural center was during the Inca empire. On the way back to Cusco we will stop by the colorful village of Chinchero , where we will find the ruins of the Tupac Inca Yupanqui Royal House, we will appreciate its well preserve Inca wall in the man square and you will visit the beauty Colonial Temple with invaluable portraits, built over Inca Bases. Then we return to Cusco. Flight Cusco-Lima and Trip on Bus to Nazca We'll be at your hotel at least two hours before your flight leaves to take you to the airport in Cusco, you'll get checked and get on board. In Lima our staff will be waiting for you to take you to the Bus Station to travel to nazca where you'll spend the night. Ninth day: On flight to the "Nazca Lines"
In the morning, having breakfast, we will transfer you to the Nazca aerodrome, prior to the flight, we will receive an informative talk for a 45-minute flight over the Pampas de Nazca where the ancient pre-Incas drew gigantic figures of animals and plants with a purpose not yet discovered, many believe that these figures were made by extraterrestrials, among which are the monkey, the spider, the hummingbird, etc .. In the afternoon we will take the bus to Paracas a city 3 hours from Nazca, in Paracas we will spend the night (Photo: Spider of the Nazca Lines). Tenth day: Tour to the "Islas Ballestas" and "Reserva de Paracas"
After having our breakfast, we will transfer you to the port of Paracas, where you will start the tour to the Ballestas Islands passing through "El Candelabro" a giant image on the side of a hill, visit the different islands for two hours, observing the different species of sea lions, seals, penguins and guano birds. After arriving at the port we will make the tour to the Paracas reserve. In the afternoon we will go to Paracas from where we will take the bus to Lima. Upon arrival in Lima, we will wait for you at the bus terminal and transfer you to the airport to make your flight arrangements to your country, there we will say goodbye. (Photo: Ballestas Islands in Paracas).